Click to watch the marimekko Spring/Summer collection for 2011. Being a pattern, design and not-so-secret textile nerd it’s no small wonder that I have a special place in my heart for the Finnish powerhouse of design, Marimekko. For close to 60 years this design house has been busy playing and creating some of the most stunningly beautiful, bold and lovely prints and designs. I can spot a Marimekko piece a mile away be is a pillowcase, a wall hanging or a dish, just ask Craig. It’s almost as uncanny as my ability to see groundhogs on the side of a highway at 85mph. 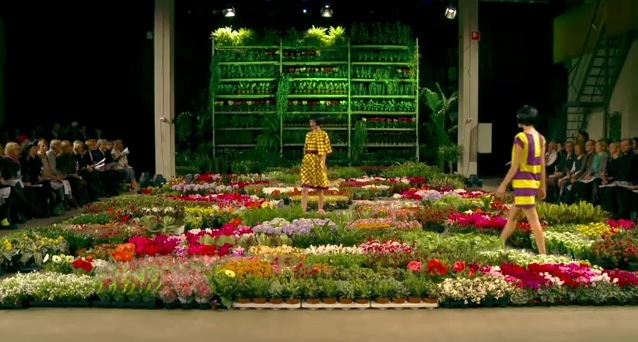 Recently I came across this video of Marimekko’s Spring/ Summer 2011 collection was breath taken. 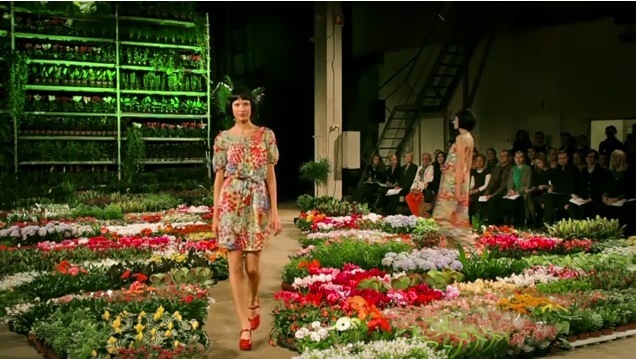 The nontraditional set up of the runway in an X against a wall of hundreds of green plants and a floor adorned with thousands of live flowers, allowing the models to turn and criss-cross rather than simply do the usual runway thing. I can only imagine how wonderful that runway & transformed warehouse smelled. You might think that such a riot of color could be seen as distracting, and a lesser design house would probably stay with more muted & neutral backgrounds to show off their work, but the genius of Marimekko lies in their designers’ ability to understand and see the harmony of pattern, color, texture, and light in vibrant & expressive combinations. It’s an exaltation of nature as well as hard work. And, with a lovely spot of music by Matti Pentikäinen. 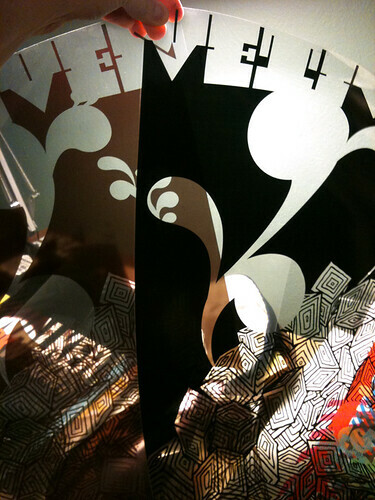 New poster released – Vetiver at Sasquatch Festival 2010! Just released and ready to go! This is my new poster for the band Vetiver, from their Sasquatch Festival show this past weekend at The Gorge on George, Wa. 2010 is the 4th year in a row that I’ve had the pleasure of working with Sasquatch in their poster series that they arrange with the top poster artists from around the country, pairing them up with their favorite bands appearing at Sasquatch each year. We couldn’t be happier that we were paired up with a great band like Vetiver! 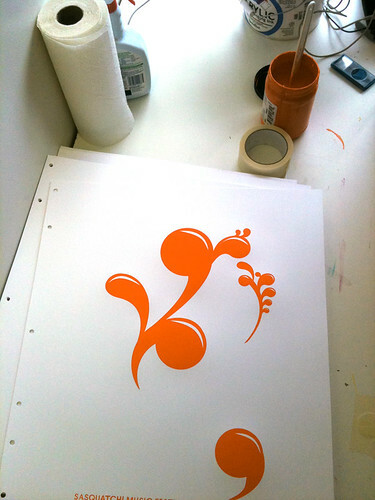 This is my 2-color, all hand screenprinted poster for Vetiver with deep brown and sunset-orange, hand mixed and non-toxic water based screenprinting inks. These posters are signed (by me) and numbered. Edition of 90. Size: 16 x22 inches (39.4 cm x 55.9 cm.) Paper: archival Cougar, White 100lb cover weight. 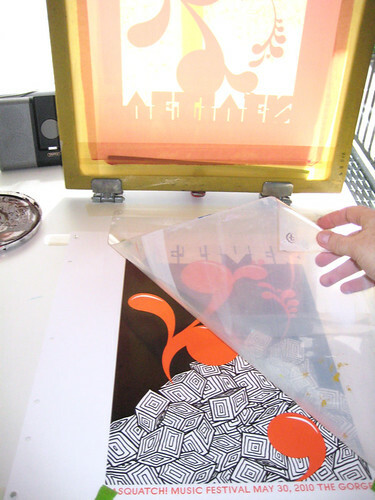 I design & hand screenprint my prints and posters. If you have any questions, just let me know! 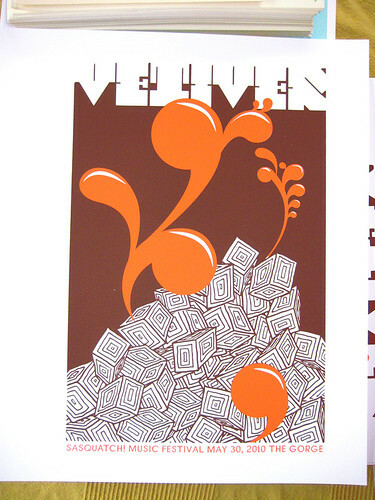 My new poster for Vetiver is now available at my website here. Below are some process photos of this poster being printed by me at my studio, click any image below to see more at my Flickr page too. Films to burn screens for my Vetiver poster. The left / lighter one is too light, the right / darker one is perfect. 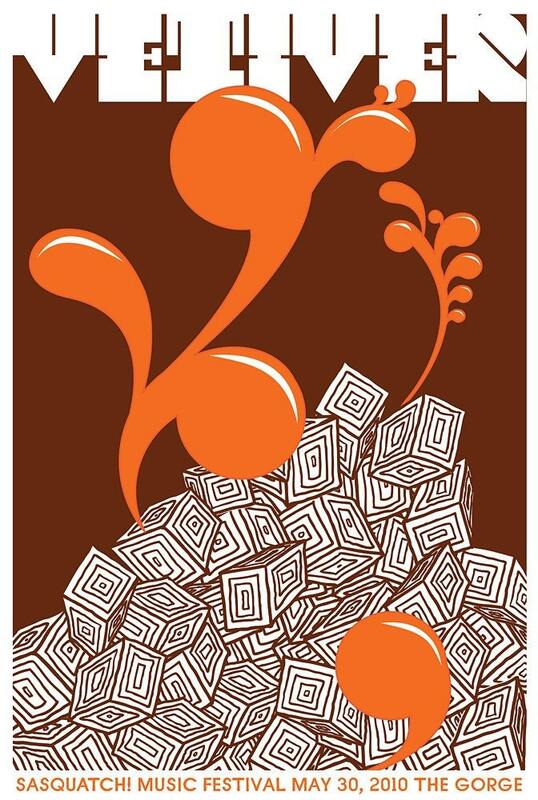 1st color of my poster for Vetiver's Sasquatch Fest show.